Key: * = similar events run by this company at other locations throughout the month - check their website! ~ = other events at this location throughout the month - check their website! 4th 'From Mercurey to Meursault' Burgundy and food matching dinner, Hush Holborn, London. Tickets £55 (food and wine included). 5th, 6.30pm Sussex Sparkling Wine tasting, Hotel du Vin, Brighton. Tickets £25. * 6th, 7-9pm Matthew Jukes 100 Best Australian Wines tasting with HarperWells, Norwich. Held at the beautiful Assembly Rooms! Tickets £15. 7th, 7-10pm Mediterranean Food and Wine matching evening, Edinburgh School of Food and Wine. Tickets £55, including a four course dinner and wines. ~ 10th, 7pm Languedoc-Roussillon Cheese and Wine Matching, Institut Francais, London. Tickets £42. 14th Chilean and Argentine wine tasting dinner, Kind Arthur Hotel, Swansea. Tickets £42.50 including a four course dinner. 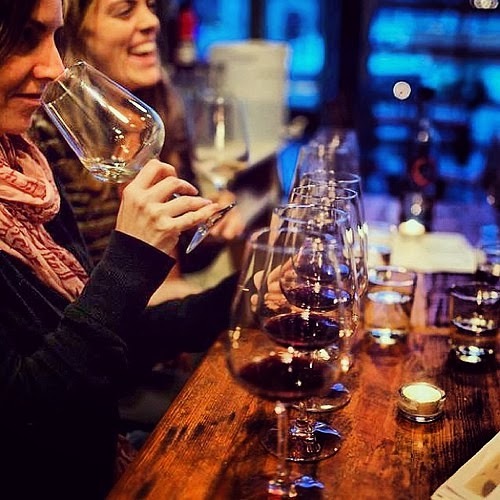 20th, 7-9.30pm Introduction to Wine SpeedTasting by Tastour, The Red Herring, St. Paul's, London. Tickets £40. * 21st, 7.30-9.30pm Chocolate and wine tasting by Birmingham Wine School, The Old Joint Stock, Birmingham. Tickets £30. 22nd, 12.30-2.30pm New Kids on the Block wine tasting, Bar Utopia, Birmingham. Tickets £25. 25th, 7.30pm Catalunya wine tasting and dinner, Flinty Red, Bristol. Tickets £50, including food and wine. * 26th, 6.30-8.30pm Leicester Wine Evening by Laithwaites, Mercure Grand Hotel. Tickets £20. * 27th, 6-8.30pm York wine tasting with Virgin Wines, National Centre for Early Music, York. Tickets £15. ~ 28th, 6.30-8.30pm Spring Portfolio Tasting, Henning's Wine Merchants, Pulborough, West Sussex. Tickets FREE! How cool is that? Just call them to book. ~ 29th, 12-4pm Champagne Jacquart tasting, Great Western Wine, Bath. FREE - including some of their vintage bubbles! 29-30th Kendal Food and Drink Festival. Tickets £8 for a day, £15 for the weekend. Image taken from Lehigh Valley's photostream under the CCL.